It's not gonna stop. It's not. The kids are on the cover of People this week with Kate, and the subheading talks about how the divorce has caused "tears, tantrums, and chaos." When will Kate get it? It's one thing to have your divorce dragged through the tabloids. It's another to give exclusive interviews to People and write books about all your children's private thoughts and feelings and behavior as a result of said divorce--and what percentage of her People paycheck did the kids' get, we're curious? With all due respect, Administrator...face it: Kate has won and you have lost. The kids look pretty happy to me. Please comment. Did they actually photoshop those kids? Half of them aren't even recognizable. That's your evidence, the kids "look pretty happy"? The kids probably "look pretty happy" because they were bribed or even threatened to sit there and be good and smile. We KNOW the kids are bribed for photoshoots because they did an entire episode about how miserable the kids were on a Good Housekeeping photoshoot. More telling is Collin covering his face not once, not twice, but three times, when he's not being bribed for Mommy's photoshoot. Like I said, Photoshop at its worst. Keep in mind, when you take 300 photos of the kids, you'll probably be able to find one worthy of publication where they "look pretty happy." Don't be so naive. Maybe they had that girl with the two puppets there again. Do you think Mady refused to be matchy-matchy with Cara? Everybody else is matching. Cara's face looks totally different as does Collin's, why did they mess so much with the photoshop they are KIDS. Maybe they were promised they could roll in the grass and draw with washable markers if they all sat and smiled for one minute. Admin said: the divorce has caused "tears, tantrums, and chaos"
Yeah and this is just talking about Kate!! Maybe they were happy because the camera guy was someone they knew from one of their hundreds of other photo shoots they didn't get paid for. Maybe they were promised water right after that one shot. Maybe she told them she was going to LA after this and they would get to be with Daddy. Next! On ROL Kate claims people scream in the aisles in Target for her. Also in the airports. Ok locals, anyone know of the Target sheeple scream fests? Anyone happening to be at the same airport as Kate ever hear screaming other than her? Of course the "tups" have to be in matching outfits! God forbid anyone forgot that they are Sextuplets! It's so ridiculous. Sorry for the rant just not in the mood this morning! Maybe they were happy because they found out their mother was going to talk about their tears, tantrums and chaos with then entire world. Maybe their faces don't look recognizable because the smiles are photoshopped in from a larger or smaller picture (from the bus when Jon met them). Actually what might have happened is they photoshopped in various faces from various pictures because they couldn't get one picture where everyone was happy at once over their mom telling the world about how they've reacted to their parents' divorce. Where they trying to make some of the kids look "less Korean" and more like Kate??? I never really thought Cara has alot of the Korean features compared to some of the kids but this photoshop is ridiculous. Hannah looks sorta odd also?? Leah, Alexis and Aaden look like the seem to look in "real" life (whatever that is for these kids).....NOT PUTTING DOWN THE CHILDREN...just noticing that some look different than normal. Maybe they were happy because they were scripted to be. I like the way they use her head for the "O" in People! LOL!!!!! Hannah's face looks like they photoshopped in a pic that was really Jon and Kate's morphed into one. Why are they photoshopping those kids? It's ridiculous! Maybe they were happy because they knew they were being photoshopped and they think they won't be recognized by their friends for once while they are embarrassed again because their mother is telling all their secrets to the world. I would have never recognized Mady had I seen her picture separate from the rest of the family. I think the only loss here is the privacy every child deserves while learning how to grow, thrive and develop to their fullest potential and to make their trial and error choices in private. This cover as well as the thousands of other pictures, episodes, DVD's, tabloids, mommy books, etc. etc. etc., are the very proof of that these children, whether smiling or not, have been denied the right to be kids. Maybe they are happy because that's not really them. Kate had them cloned (with permanent smiles) so she can film twice as many episodes without getting in trouble with the Dept. of Labor. Cara is less recognizable than Mady. In fact, I don't think those are really them. Maybe they are wax figures because they couldn't get all the kids to sit together nicely and smile. Did they shoot the photos during the vacation? (cough, cough!) How much did they work during the couple of weeks they saw Mom? Tony apparently grabbed the private plane with the winners last night to get home to his family. No sign of Kate on the plane. or in the airport. Maybe she's still in the rafters at DWTS. You're right Admin, it isn't going to stop. You know what they say - hell has three gates and GREED is one of them. That pic has to be photoshopped. We all KNOW the kids never smile around Kate. Really bad photoshopping! Aaden is unrecognizable. Cara is....I don't know what to say about Cara. Kate with the big mouth, the only time you see her like that is on a photo in a rag mag, never when she is alone with the kids at home or abroad. They all look really, really bad. The novelty which caused us to watch their series when they were babies and toddlers has worn off. She should not be subjecting these children to any more of this lack of privacy. How would you feel if you grew up and knew that the whole country kept talking about you and all of your troubles. I see some very tragic results in their futures. Those twins are unrecognizable. Some of the tups too. Why on earth would anyone to that??? I'm afraid you are right, it's not going to stop. Is that Colin off the page? Cara has really become a beautiful child but in this picture she just looks homely, it's not fair to her. She is much prettier than that. A true smile hits the eyes. Look at the kids eyes; for the most part they aren't smiling. Thanks Berk, PA. I read the article on the Preesi site. "Gosselin, who hung in for five weeks on this season's competition, told RadarOnline.com's Tina Malave that her sometimes-tense training sessions with Dovolani were loose and relaxed now that the pressure is off. "You know, moms-of-eight don't typically do this, but you know what, whatever, I just had fun and this week was so much fun practicing, we practiced less and laughed more, and I just had a blast," Gosselin told us exclusively. "This was just my redemption week." Gosselin, who said appearing on the program was "just a really great experience for me," filled us in on what it's like to have been the center of attention the better part of the past year since her split from ex-hubby Jon. Said Kate: "I know that a lot of people love me and support me, and I know that because when I'm at Target, they scream across the aisles, when I'm at the airport they're screaming for gates saying 'We love you Kate, we support you,' and for that I really have no words, cause you know, how many times in life do you get to do your daily errands and people say 'I love you?'" Malave, a newlywed, asked the mother-of-eight for any advice now that she's tied the knot. "I am so sorry -- did I say that? -- congratulations, that's what I meant," Kate replied." The photo would be more believable if PEOPLE had just put eight bags of money on the couch in front of Kart instead of the kids. I would say more people are laughing at how she did on DWTS last night than how she looks on People magazine. She was able to make herself look more a fool than before. How about when she said "90% of MY audience doesn't like me"? OMG! How about the lighting on her at the end when she jumped up onto the camera dolly? I bet she wishes she NEVER did that. She looked like something out of a horror movie. How about the lighting on her at the end when she jumped up onto the camera dolly? Pause the video @ 50 seconds. Spooky! Troy a fellow Canadian,on the DWTS blog here, said Kate looked like Donkey from Shrek when she was on that dolly. I looked at the video again and my Canadian friend is absolutely correct! I realize I am insulting Donkey but the resemblence is amazing! With all due respect, no one knows for certain that these pics are photoshopped. When the photo barely resembles the 'real' kid, I would most definitely say they were photoshopped. Kate did not win anything....8 kids have lost. They lost the innocence of the only childhood they can never get back, they lost the unsKripted play & fun that comes with being kids, they have lost summers, weekends, holidays and schooltime. Sorry, but the Gosselin kids lost more than Kate ever tried to give them. You almost wonder if that WASN'T scripted, she just did it when she saw the opportunity? The looks on everyones faces was a mixture of "huh?" and "OMG". On a side note, I am sorry to say that Brook's doctor called and said that he needed to remove some air and bring down the mellons some. I think they were so over the top, literally, that she looked comical. LEt's see....In the past week, Bret Michaels who almost dies twice wins Celebrity Apprentice; Michael from Biggest Loser wins by losing half his body weight; Idol finals are awesome; John Travolta's family is growing; Britney Murphy's husband dies. The stock market tumbles, the oil spill worsens, North/South Korea at each other's throats. And all PEOPLE can come up with is Kate Gosselin? I realize I am insulting Donkey but the resemblence is amazing! Well @MaksimC I couldnt get u the cover of TV guide or People..but we finally made @SportsCenter Top 10..yup, there it is..
Tears,tantrums and chaos?We have watched the kids(and Kate) have all three from season one thru five. What's the difference?How many times have we seen the kids playing and having a really good time,then mommy dearest steps in and puts a stop to it? Can't have any fun when Kate's around.Too dirty,messy,ickey. Kate thrives on drama. If there's none in her life she creates it.I don't feel sorry for her one bit. Another blog is discussing your comment and of course all they put there is that you said she looked homely. Kate Gosselin made lots of people watch 'Dancing With the Stars' before she was kicked off after five weeks, but one thing she didn't make was friends. According to my sources, Kate's return to the show's season finale last night only reminded everyone of how high-maintenance she was during her time on the show. Inside scoop on Kate's disastrous return ... after the jump! Seconds before Kate Gosselin was to hit the floor live on the 'Dancing With The Stars' finale, the octomom was once again causing trouble backstage at the ballroom. "We had all just about forgotten what a nightmare Kate was," an insider tells me. "She is the only celebrity in the entire 10 seasons who has demanded a security guard be with her at all times, and nothing anyone does is good enough. Last night, she actually wanted the temperature of the ballroom changed before she hit the floor. Kate hates to sweat and this was just another opportunity for her to be difficult." However, it wasn't just the producers that Kate tortured. Sources tells me the hair and makeup staff dread her interfering, and the costume designers and dressers flip a coin to see who is going to have to deal with her. But the person who really deserves a prize is her partner, Tony, who is telling people that the notoriously difficult Barbra Streisand would be easier to work with than Kate. I read a comment on ROL just now (reminded me why I don't normally read the comments) and some crazy people are acting like it's an insult to say that the kids look photoshopped on the cover. What's wrong with saying that? I think Mady and Cara are beautiful young girls and the photoshopping they did on that cover does not do them justice. I don't understand how a child advocacy blog would say a child looked homely. IMO, the kids are are still attractive. I just think the 2 of the boys look a bit different. It has been almost a year, hasn't it. Tristan, you completely missed the point and twisted my words, a typical tactic of the 10% who support Kate. I said in THIS photo Cara does not look good, and that she is in actuality a beautiful child and does not normally look like that. My point was this photo is unfair to her the way it's been manipulated. I'm guessing Cara wasn't in the editing room with input over what photo gets picked of her like an adult would--another disadvantage of being an exploited child in this business. She's always reminded me of the striking actress Karina Lombard, what she might look like as a child. For the record, I think Cara is beautiful. Jon was the one who called Cara homely in general--not just a bad photo. Why not call out Jon? You've never had a bad photo of you taken, ever? Everyone has. We have the luxury though of our mom not plastering it all over People magazine. I am truly sorry for you if all you see from this very sad situation is that Kate has "won" something. She may have "won" some more cash, some more face time on a magazine, and another opportunity to chip away privacy and respect from her children, but she is losing so much more. She either doesn't see it or she just doesn't care. For whatever reasons - naivete, ignorance, greed, stupidity, ego, narcissim - your Kate is systematically destroying her relationship with her children by selling their privacy to ANY bidder. She is teaching her children that they cannot trust her to protect them. She is gambling with their well-being in every way. I don't see any winning in that for her or for the children. This is a blog about the Gosselins and what they're up to, I don't know why it is always called a "child advocacy" blog. Most people here happen to talk about the kids being exploited because as Kate said, 90% of us think they are. I don't know why you would ever photoshop a child. Children are beautiful because they're children and young and flawless and innocent. This family has gone so far Hollywood, now even the kids are being manipulated with when they are perfectly beautiful without one airbrush. WTH? The kids looks WEIRD in this cover. What happened to Mady's braces? I have magnified the pic and the twins are unrecognizable as well as a couple of the tups. This is really a bad photoshop. People mag should be ashamed. My guess is that the camera men/women wore Aunt Jodi and Uncle Kevin costumes; that's why the kids were smiling. Seriously, before I came here this morning, I saw the cover of People on Cover Awards. I instantly felt sick. I know of no other celebrity that is constantly FORCING their children into the spotlight like Kate is. For the person who says "the kids look happy". Well, do you really think People is going to put a picture of sad kids on the cover? Paul Peterson smiled A LOT in the Donna Reed show. Does that mean he was "happy"? I am so sick of this woman on People magazine!!! Is the president of TLC sleeping with the editor of this magazine! So many other worthy people who should be on the cover! I want to know what is wrong with PEOPLE Magazine to keep giving publicity and covers to Kate Gosselin. I'll probably never buy the magazine again. I have been looking for a reason to cancel my People magazine subscription for some time; I think that this may the time. Enough. I thought still photography was against the law in PA for children under seven.. Did something change? Those poor children. Say what you wish about Jon and I don't condone his behaviour this past year, but he is their father and now that their parents are divorced, these youngsters don't need their emotions discussed for publication. This is child abuse. Cara and Joel are completely unrecognizable, Collin is ready to get the hell outta there, and Mady is rockin'that red and black hat. You go Mady girl!...can't wait for your tell all book. LOL, this isn't PROOF of anything. The kids were in a photoshoot. They can't LEAVE until the photographer has a PERFECT PHOTO. So, this was probably taken HOURS and HOURS to get this shot. Even so, it is HEAVILY photoshopped. Compare the fake smiles to when the kids see JON. NO STAGING, NO FORCING. The kids just naturally SMILE AND HUG HIM when they see him. Kate has been gone for over a week. Will the kids GREET her with hugs and kisses? Just because the kids are "smiling" in a PHOTOSHOOT doesn't mean they're happy. Ignore Kate's 10%. They are on the verge of extinction anyway. Imagine how awful it must be for them to admire something like Kate Gosselin. I do feel kinda bad for them sometimes. Not. Like you said, Cara IS a beautiful little girl. Unfortunately narcissists like her mother are usually jealous of their daughters. They are apt to do things like pick out photos that are less flattering, in order to make themselves look better. Kate's NPD is severe and it's getting worse. I'm pretty sure Collin (? the middle boy, I don't watch enough to be able to tell the kids apart) is photoshopped - his head looks bigger than his brothers, and also, is it just me or does his face seem younger than theirs too? As if they took his head from a photo from last year and the others are from this year? I also think that the camera captured him in the middle of trying to hide/cover his face - who poses like that? It looks as though he's trying to twist his body away from the camera and put his arm up to shield his face. SHAME ON PEOPLE MAGAZINE AND KATE GOSSELIN!!! Nothing is sacred for these kids. No privacy in their bedrooms or bathrooms. And now their faces have been photoshopped until they are unrecognizable. They don't even look like themselves. This is simply disgusting. Circus animals have more protection than the Gosselin 8! My guess is that they've all be photoshopped. The dead give away is that they all look like bobble-heads (notice how pointy most of the chins are) and the neck shadows are odd. my9cats said...Anyone happening to be at the same airport as Kate ever hear screaming other than her? No, but I heard some people were yelling at her at Disneyland. my9cats said... Anyone happening to be at the same airport as Kate ever hear screaming other than her? No, but I heard there were some people yelling at her at Disneyland. Maybe these are the kids who deserve the Golden Platter Kate was talking about. Look at how different the promo pic from the people mag picture. Is it just me or are people tired of Kate Gosselin? The critics seem tired of reporting about her tv appearances. I think we all just want her to go away now, she has annoyed us enough. akbennet - Maybe they 'looked' happy cos mom lied to them, again, and told them mommy and daddy would be together forever. Photoshopping is the norm. Whether the Gosselins were on the cover or Brad and Angelina's kids or non-celebrity kids- they would all be photoshopped. Not really a big deal and certainly not Kate's doing. I thought I'd seen it all concerning Kate but...I just watched her on ET and it was disgusting. She was taking the mic away from Kevin and said she should have been born with a mic in her hand. She goes on and on and of course in her annoying,screaming voice. I wouldn't be surprised that ET or someone is not offering her a gig of some sort. Seriously people! They are showing too much of her and she has hinted to many times that she wants a job on ET. This woman is truly sick and if I were a relative,I'd be calling Dr.Phil.Even Dr. Phil couldn't handle Kate Gosselin. I was relieved to read these comments because when I saw the pic of the People cover, I thought "wow, I guess I had no idea what these kids looked like! They look VERY different!" Then I read the comments and it all made sense. Glad it wasn't just me disturbed by how not like themselves they look! It's creepy to do that to kids! AK, I hope you'll come back and explain what Kate has won. It isn't the respect and admiration of her peers. It is evident from her time on DWTS that she turned herself into a laughing stock. She thinks 90% of her audience hates her. That was her own doing. Is that a win? Maybe you think she won because she has money, but her $120,000 a month wasn't enough. She's driven to obtain more...and more. And she's not having any fun doing it. She's obsessed and that's no fun. Her latest book was a huge failure, she's pissed off people who never even knew who she was before her disastrous DWTS debacle. What has she won. Hope you'll come back and explain it. There's a lot of chatter and debate about photoshop, but I haven't heard one justification for why it's okay for Kate to tell People magazine all about how her children are suffering through this divorce with tantrums and tears. Disgusting. Judy, I said basically the same thing on my other blog...someone needs to intervene on Kate's behalf, she IS getting worse IMO. Sadly, I'm not sure there's anyone TO intervene on her behalf. Didn't she seem 'high' on that ET interview? Manic/depressive in addition to NPD???? Photoshopping might be the norm, but it is a big deal when the kids don't even look like the same kids. And Kate probably saw the picture and thought it was ok. WTH is the reason to photoshop kids ? What is wrong with the way they naturally look ? They are beautiful children. This is disgusting, Kate is disgusting, TLC is disgusting and People Magazine is disgusting to keep putting this nasty beotch on the cover of their magazine. Are they possibly wearing a little makeup as well? Like some powder to cut the shine. I hope not, but how disgusting to put makeup on 6 year olds. Noticed on ET while Kevin is interviewing Buzz and Ashley, Kate walked behind them, then Ratboy, then Tony in that order. Are Steve and Kate so inseparable that he has to follow her around even backstage? Good grief, does ET really want Kate Gosselin on staff? You would think they'd want someone with some sort of background in broadcasting, not this screeching banshee. I agree with you Carolina Gal, she was in the manic swing of her MDD. Kate hasent won anything.We knew these 2 new shows were coming.Kate can still lose/fail.If there are no ratings then there will be NO shows.TLC spends alot of money trying to make kate into super mom...not to mention more money on these lavish vacations ect. DONT watch the damn shows! Yes! Its that easy.No ratings=no sponcers=NO money.Dont peek cause you just HAVE to.I care nothing about what this wench does or says...I dont search for anything kate on the web...I dont click on anything kate.I go to this site and GWOP...thats it. The kids only hope is the public...we need to care enough NOT to watch! Administrator said... "There's a lot of chatter and debate about photoshop, but I haven't heard one justification for why it's okay for Kate to tell People magazine all"
That would be because there isn't any justification. It's not enough she's done tons of interviews about the divorce & the children's reactions to it, not enough they devoted much of last season (and likely the new shows as well) to the divorce, not enough that she wrote an entire book about her kids private feelings. She HAD to do a People interview to truly get the word out about her sacrifices in the name of her children. And the kids HAD to be part of the photoshoot in order to ensure more people would buy the magazine and read her drivel. Even she's smart enough to know her fame is entirely dependent on those eight (though for some reason the focus always seems to be more on the six which I think is dumb as it was the twin-sextuplet COMBO that got them noticed, not just the sixpack - Dilleys & McCaugheys had them beat there). As for the photoshopping I can understand the need as trying to get more than one kid smiling at the camera at the same time is near impossible. BUT this is a wealthy magazine and you'd assume they employ people who know what they're doing. From photographers who can coax a smile from grouches, to photo editors who can create photoshop masterpieces that look 100% natural. Instead they choose to use an obvious and very badly done photoshopped photo as the cover? They should just rename the magazine 'TLC sellout'. Between the exclusives with the Gosselins & Duggars People has become a one-magazine sales team for TLC. PS. Does anyone else think Aaden looks a bit scared? Why do the kids have to be beaming ear to ear anyway? I like the Plus 8 photo so much better...one of the girl's is scratching her arm, one isn't smiling, some are more focused on poking through the giant 8...it's more natural, how kids really act when forced to stand there for who knows how many hours for a photoshoot. We know that the kids are being bribed,threatened,sweet talked,or what ever else you want to call it...To sit still and smile pretty!The tups are not 2 anymore...They are 6 and can understand being told sit laugh and grin OR else! I can see kate saying...YOU MUST do this and YOU must do that. If you dont then we will go back to having nothing...no money for fun stuff...no money for food...Mommy will have to go back to nursing and I'll never see you!! And its all because you wont SMILE! !Thank your father kids!!! uugggg...kate is insane...dosent it take 3 family members to have her commited for 48 hours? HUMMMMM!!! GAK! I saw the "interview" between Kevin and Kate on ET last night and, perhaps it's just my thought, but Kevin didn't seem so pleased that Kate grabbed the mic. She said she was born with the gift of gab and should have been born with a mic in her hand. I agree she does have gab but it's not a gift. She hints she wants a career interviewing......good grief! She doesn't have a random thought in her head except about herself. She couldn't interview anybody and ask an a pertinent question if it wasn't about herself. I wish that woman would GO AWAY. On another note has anybody else noticed that the Kart supporters are oddly silent these days. Perhaps the disastrous DWTS "reunion" showed them what a lunatic that woman is. She appeared to be high or drunk. On ET last night, when her "dance" was reviewed she looked very thick through the middle. Kart has put on a lot of weight. The bikini pic also showed evidence of that. Disturbing and frigtening. These children don't look real. TLC and Kate have sucked the life right out of them. People of course, ROL-team Kate! It is imperative that the law changes to allow these kids some protecing. On ABC, the Dancing With The Stars season finale scored a 3.8 rating, that’s up 52% from last week’s standard results show, but down 27% from last spring’s finale, and the show’s lowest rated finale ever. Kate makes them $. It's not really that difficult to understand. Is it me, or does it seem like they've (the media) been doing the same interview with Kate for a year now? I thought the latest book was supposed to talk about the kids and the divorce, etc. What more does this woman possibly have to say that hasn't been said before? Enough already. There is no justification for Kate exposing her children and the divorce to this kind of public scrutiny. None. 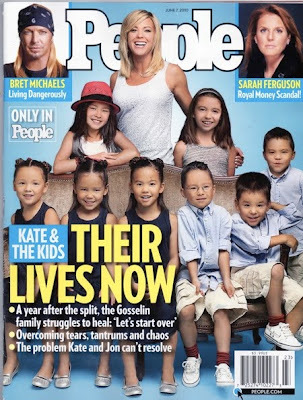 PeopleLife with Jon Gosselin, says Kate, "feels like 10 years ago." In the new issue of People magazine, out Friday, Kate, 35, gives an update on how she and her famous 8 are doing. "I'm sorry to disappoint you, but it's not any calmer," she tells People of her custody issues with Jon, 33. "It just appears calmer on the surface … It's just I've had to internalize and keep quiet the rest of the stress. But it bubbles within me and it spills over, and sometimes [the kids] see it." She says the kids sometimes struggle, too. "Mady said the other night – which every kid of divorce unfortunately is going to say, and I know to expect this – 'I'm always sad. I'm sad when I'm with you because I miss Daddy, and I'm sad when I'm with Daddy because I miss you,'" says Kate, who trades off custody of the kids with Jon at the family's home in Pennsylvania. "I feel bad that they're torn that way. But at the same time, I still know that it's really better overall," she adds. "I've actually overheard them admit, a time or two, that yes, home is more peaceful now. And that's a good thing." She has a tough time finding her own peace, she says. "I don't think I really know how to even relax anymore. Any little shred I had of that is gone." Especially difficult was the sextuplets' birthday recently on May 10th, when Jon took the kids for part of the day. "That hit me hard," she tells People. "Sitting there, thinking, 'Six years ago I gave birth to these babies. I was probably in the NICU right now. And where are they?' That was so hard." She says she's positive about the future. "There are moments when I do see glimpses of what a normal life might be," she says. "And I mean normal in the sense of getting used to this, feeling like I can manage this change." But, she adds, "I'm not there yet." IATK, I think most people who watched all of this DWTS, pretty much knew exactly who would win, who'd be in 2nd place and 3rd...I know I did. I'm still a bit miffed that Nicole was even on the show, she's a dancer for heaven's sakes! Mady, it may seem like you're just a tv extra in this sham of a "reality" show but I hope you continue to express your opinion...and speak the truth, freely. Let's face it, TLC knows the show's appeal and focus is on the sextuplets, not the twins. It just makes Kate's "mothering" seem even more daunting when you mention 8, not 6. Can't comment on the rest of the article because it left me with a sick feeling in my stomach...gotta lie down now. You are not alone. Kate keeps babbling about the same BS over and over again. It's like Groundhog Day with her. At least she's in the right state, but that's about it. I am combining comments for the People story and new girlfriend issue. I don't see how it is anymore damaging to children to meet a new girlfriend than to all of a sudden have a parent excised from what has been the central focus in their lives; filming JK8. I wonder if the kids ever ask why they get to go on all the fun trips with their mom but not dad? Also, ROL has not posted anything about the People cover which I cannot figure out. Normally, they would have had that story up there stat. I am thinking TLC is trying to somehow levitate Kate above their normal schlock. I watched TLC a couple of weeks ago and they promote all their shows in one breath and then say, "and kate plus 8 will be returning". Returning? Just cause you say it ROL, doesn't mean it's true. As for PA passing a law for child labor? Doesn't matter. They will be living in LA within 2 months. Gag. Now I will try really hard to post under my screen name and not anonymous! Just wrote a book and tried to post with my name instead of Anonymous. Didn't work! To make a long story short, why hasn't ROL posted the People's gag inducing cover? What is ROL's connection to TLC? Also, the kids meeting Jon's girlfriend cannot be as damaging as Kate/TLC trying to excise Jon from their lives. Signed, escape. Yes, 2exhausted. I do think Aaden looks a little bit scared. I also think he has every right to. His mother is getting more and more unstable by the day. Is Kate finally home yet,or is she still in L.A.? Sorry to go off topic. LOL! People think we are saying that they photoshopped smiles on the kids. I think they tried to remove undereye shadows or maybe bags, etc and it just came out looking fake. I don't think they superimposed heads or anything... I just think they used photoshop to touch them up with bad results. The photos on the inside look much better, it's just the cover that looks manipulated. I would like to clarify that I was being facetious in my replies to akbennet yesterday. Some people felt that my fellow posters were not intelligent enough to realize that I really did not think Jon was behind the camera. I did not really think Kate would let them roll around in the grass or draw with markers if they smiled for the camera. My only point was that because someone smiles for a photo it does not automatically mean they are happy. I am also not saying they are NOT happy. I'm just saying the two don't automatically go hand-in-hand. I do think that all the regulars are smart enough to know what I meant, but apparently not everyone is. And I still say there's nothing wrong with pointing out that the children's faces look photoshopped and thus changed the way they look. It's not an insult to the children in any way, shape or form. Yes, I think the inside photo was a great photo. I was watching a documentary on the assassination of Lincoln, and realized that Kate and John Wilkes Booth both had similar ambitions. I know that sounds far fetched, but prior to the murder, he reportedly stated, "When I leave the stage tonight, I'll be the most famous man in America." He didn't care HOW he would be remembered, only that he received notoriety for his actions. Ditto with Kate. She wants to be the most famous mom in America, even if 90 percent of HER audience hates her. I think she figured when she left the DWTS stage, she's be remembered by generations to come. You know, that confuses me, I mean, I teach for a living and in all my years of meeting with parents the one thing they do NOT want to talk abouit is their kids tantrums and misbehaviors... so why is Kate so blunt and forward with destroying her 8 kids with what's wrong with their actions and feelings??? Is it justifying her bad behavior or covering it? because Jon has said it in the "pink attic painting episode" in the old house: "Kate has no patience"
What a joke of a mother she is. I was in line at the grocery store today when a young woman in front of me said "Hey, look who's on the cover of people?" The other woman looked and said "Give me a break" and then took the top copy of the magazine and turned it around backwards so you couldn't see the picture. I think Kate likes to have those moments shown so people think she has it so rough, and has to deal with so much all the time. 'Woe is me... I have 8 kids who have tantrums and meltdowns all the time. Poor , poor me.' It just reinforces her pity party. If the kids are embarrassed by what is shown, they are probably told to deal with it. And that just goes to Kate's complete lack of self awareness. She thinks these tantrums will make us feel sorry for her. When really we just think, how could you exploit your children like that telling us all the private details of how they cope with the divorce? Let's see....just who in this whole scenario is putting the KIDS first?